Weekend Warrior Workshop at WOW (Workshops On the Waterfront), 117 Market Street, Apalachicola, FL. Joseph Palmerio, March 24-26, 2017, has been Postponed to Fall, 2017. Dates to be announced. Workshop utilizing two color palette, emphasizing warm and cool relationships. We will also cover complementary color palette, making use of and understanding the secondary colors of the palette, simplifying the landscape using limited palettes, and understanding the sky and how it relates to the entire landscape. …more details to be announced. The workshop was a success! Thanks to all artists who participated. Come join other artists in this 2-Day Oil Painting Workshop. 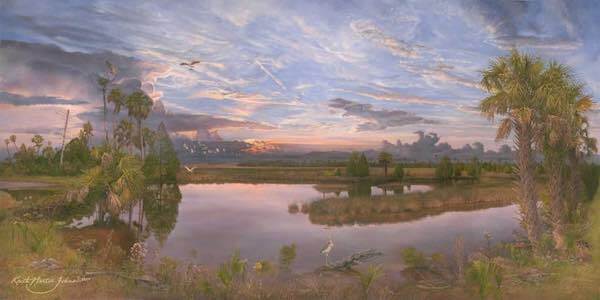 Together learn exciting principles taught by Keith Martin Johns, MFA as he leads students to strengthen their skills and practice professional techniques to create beautiful oil paintings of Florida’s marshes and spacious skies.